Green was the colour of the day in Abu Dhabi as Team Ireland thrived on St Patrick’s Day at the Special Olympics World Games securing a total of 21 medals, including 10 gold, eight silver and three bronze. With Irish support in abundance, Ulster athletes received 11 medals in gymnastics, athletics, tenpin bowling, equestrian and bocce. Coming up trumps for Team Ireland was Donegal gymnast Patrick Quinlivan (36), who swept the board and received two gold medals and five silver medals. The Letterkenny athlete was awarded a gold medal as all-round male, as well as receiving a gold medal in the Pommel Horse event and five silvers in floor exercise, vaulting, rings, parallel bars and horizontal bars. Special Olympics World Games in Abu Dhabi on Sunday 17th of March 2019. 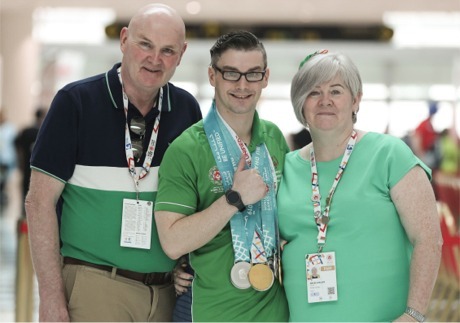 Patrick Quinlivan from Letterkenny, with his parents Angela McGee and Mick Quinlivan, shows off his 2 gold and 5 silver medals that he won in gymnastics. Rounding off the day with a striking success, Amy Delaney (16) from Derry took first place with a gold in tenpin bowling, with her fellow team mate Gemma Steele (25) from Coleraine receiving a sixth place ribbon.